MTG Industries is a board sports and apparel brand that was founded in 2015 and was officially incorporated in 2016 as a Benefit Corporation by Maximilian Thomas Gaichas (MTG) -- a high school student at Pine-Richland High School in Gibsonia, PA, and an avid skateboarder, longboarder, and snowboarder. Back in the Autumn of 2015, Max was cutting his own longboard decks out of old pieces of plywood in his grandfather's basement woodshop. After adding grip tape, trucks & wheels to his handmade longboard decks, he rode them, modified them, and kept making them better. He had so much fun making and testing the decks, he decided to start a company and create his own brand of skateboards, longboards, and snowboards. After realizing that he couldn't build everything himself, months of planning and research began, and US-based design and manufacturing partners were selected. Then, he got-to-work planning his skateboard, longboard, and snowboard lines. As of August 2017, the first skateboard series -- The WildLife Series -- was released, and is now available in skateshops in the Pittsburgh area, from our US Web Shop, and on Amazon.com. Our limited edition 2019 RockArt Series snowboards are now available at Peak Ski & Board in the Pittsburgh area and from our US Web Shop. Over the next few years, MTG Industries will continue to introduce longboard, snowboard, and apparel lines, along with some additional skateboard deck shapes & designs, and some other cool things, so stay tuned, and keep watching this space. MTG Industries skateboards, longboards, and snowboards will only be manufactured in the United States of America. As long as there are manufacturing facilities in the US that make the best boards -- using the best materials and manufacturing techniques -- our boards will continue to be Made in the U.S.A.
MTG Industries skateboards, longboards, and snowboards will be the best quality products on the market. You can trust that what you buy from MTG Industries will be made well and will perform well. In a world where most board sports brands are in a 'race-to-the-bottom' -- offering mediocre products, at bargain-basement prices -- you can trust MTG Industries to sell the best quality boards at a fair price. When people see you with your MTG Industries deck, they'll know that you're smart and skate only the best quality decks. MTG Industries was founded as a Benefit Corporation. That means that we are a for-profit company that is dedicated to doing good. Most companies only care about lowering costs and increasing profits, usually at the expense of workers (by lowering their pay, or getting rid of them), or by cutting corners (by moving production outside of the US and using poor quality materials and shoddy manufacturing practices). MTG Industries contractors are paid a fair, prevailing (or better) wage, and we only partner with US-based manufacturers, that pay fair wages, treat their workers well, and are governed by all of the health and safety regulations required of manufacturers within the United States. MTG Industries operates as a low-impact business (very efficiently, with very little waste); prioritizes high product quality over low-low-prices; considers worker health, safety, and good wages, when choosing partners; and carefully considers the impacts (both positive and negative) of business decisions (consciously off-setting the negative impacts). MTG Industries will seek full B-Corp Certification once we have been operational long enough to meet the required standards. More information about Benefit Corporations and Certified B-Corps can be found by following the links below. Yes, board sports can be really dangerous. However, riding a skateboard, longboard, or snowboard can also be one of the most wonderful experiences that you can have. MTG Industries believes in inclusion and that board sports should be for everyone. Nobody should ever feel like they don't fit-in, or that board sports aren't for them. We want people that aren't traditionally interested in board sports to feel welcome and to have a great time skating or snowboarding. There is no room for discrimination, sexism, or any kind of hateful or derogatory speech and imagery in our industry. We are also an LGBTQ+ friendly company. MTG Industries is the marquee sponsor of Skateburgh -- Western PA's most inclusive summer skateboard competition. In the months and years to come, we will be sponsoring even more events that will promote board sports for all. Everyone is welcome -- get a board and get out there! When you buy an MTG Industries branded product, you know that you are supporting the right kind of business -- one that does good, beyond the high quality, and great performance, of the products. All businesses have an impact on people and the environment. It's up to every individual business to analyze everything that they do, update practices and processes in order to reduce or eliminate negative impacts, and then track and measure the things that they have less control over, and off-set the negative impacts that they are responsible for (even indirectly, and by way of third-parties that they do business with). MTG Industries products are well made -- of the best materials and with the best processes -- so they last longer than the products made by lesser brands (that means that MTG Industries branded products create less waste just to begin with). We are working on projects to preserve the value of our products at the end of their useful life (when your deck wears-out, for example). These projects could include making art objects or other useful items out of worn-out products, or even coming up with ways to use the old products as raw-materials for new products (also known as up-cycling). We'll provide updates as the projects progress. If you have comments or suggestions on up-cycling projects for our branded products, please contact us and let us know. At the end of the day, life is not about staring at our phones and working ourselves to death. A good life comes from achieving a balance between our responsibilities and the fun and healthy activities that we can choose to do. MTG Industries is built to achieve a fantastic work-life balance -- we are a for-profit company, but we really want to enjoy the things that we do and take pride in the products that we create and sell. So, finish what you need to do, and then get out and skate! 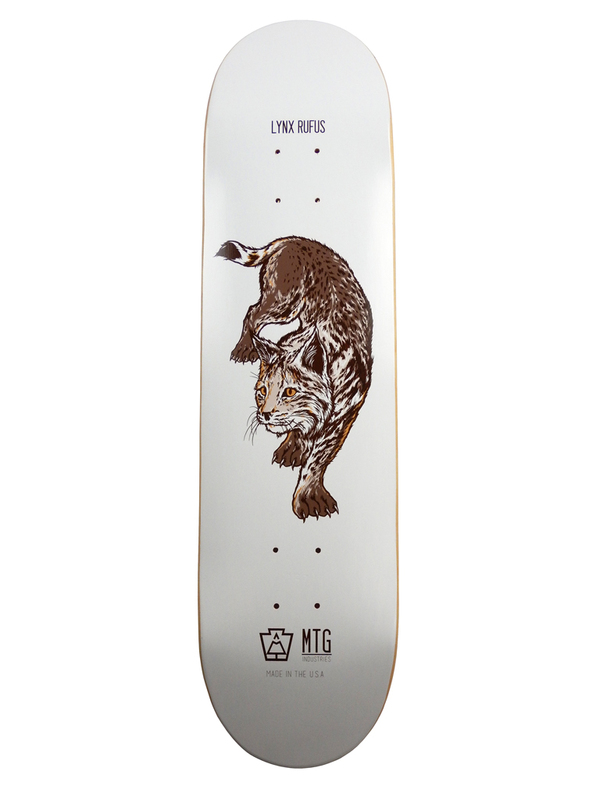 MTG Industries Ursus Americanus Skateboard Deck -- 8.5"
MTG Industries Agkistrodon Contortrix Mokasen Skateboard Deck -- 8.25"
MTG Industries Lynx Rufus Skateboard Deck -- 8.0"
MTG Industries WildLife Series -- Available Now -- Made in the U.S.A. The MTG Industries WildLife Series Skateboard Decks are available in stores, in our US Web Shop, & on Amazon.com. Inspired by Nature. Built for the Street and the Park. Designed and Made in the U.S.A.
Every purchase supports Wildlife and Environmental Organizations. Introducing the MTG Industries 2019 RockArt Series Snowboard. Check out the full specs in the Products section. RockArt Series Snowboards are now available at Peak Ski & Board in the Pittsburgh area and from our US Web Shop. We are working on more skateboard, longboard, and snowboard lines. Keep checking back for updates. Introducing the limited edition MTG Industries 2019 RockArt Series Snowboard. Designed and Hand Made in the U.S.A. An ultra-high-quality all mountain and freestyle snowboard that is perfect for the terrain park and the slopes. Available in 157cm and 154cm configurations. Check them out at your favorite shop. When they're gone they're gone. This is a limited run. Freestyle + All Mountain snowboard for intermediate and advanced riders. Rocker Camber construction blends a custom rocker profile with separate camber areas at each end of the board, providing unmatched power and snap out of turns. True Twin - Low Profile Tip/Tail — A low profile in the nose and tail of the snowboard maximizes material contact with the snow for more powerful ollie/nollie pop and stability to your landings. The Low Profile Tip/Tail also reduces the plowing effect in the nose for better glide to the next feature and superior float when it's deep. Flex Rating: 5 (medium) – Perfect for all mountain riding, while still great for the terrain park. Super-Light Full-Length Wood Core – A blend of extremely light wood with durable hardwood for unmatched strength to weight ratio. BI-LITE Fiberglass combines a super-strong and an ultra-light glass fiber matrix. This delivers incredible freestyle and freeride performance without sacrificing durability. Vario Grip Sidecut utilizes multiple radiuses creating extra contact points to enhance edge hold. A flat section in the rocker area provides a broad contact point when flexed; when unbent, it allows the board to track straight and not catch. Flanking the straight section are two shallow radiuses which provide the second and third contact points. Towards the ends of the sidecut are deep radiuses which render quick turn initiation and the final contact points, providing added control and response in any conditions. Rubber Damping System utilizes thinner rubber foil for a lighter, snappier feel while still providing a smooth, chatter-free ride. Sintered P-Tex Sidewall – unlike conventional ABS sidewalls, that have a tendency to crack in colder temperatures, the Sintered P-Tex Sidewall maintains its integrity at any temperature. Sintered P-tex Base – an exclusive, super fast, durable sintered base with just the right amount of graphite to form the fastest base there is. Fully Wrapped Metal Edge – provides unmatched carving ability and edge grip. Matt Topsheet – a very durable, scratch and chip resistant material. This premium textured material also provides more grip than a gloss topsheet. The MTG Industries 2019 RockArt Series Snowboards are Designed and Hand Made in the U.S.A.
Purchasing this snowboard Supports Wildlife and Environmental Organizations. ...make sure to include enough postage for us to mail the sticker back to you. Feel free to include poems, manifestos, and safe-for-work photos. © 2015-2019 MTG Industries North America, Inc. A PA Benefit Corporation. All Rights Reserved.